Zeitgeist is a comic book series published by Approbation Comics. It is written and lettered by Approbation boss, B. Alex Thompson, and drawn and colored by John River. The series, which is told in an episodic style that mimics a Sunday newspaper comic strip, follows the misadventures of on-the-go twenty-somethings. Zeitgeist #1 presents Strips 001 to 036. This first issue opens in a large comic book store. Employee Isabelle Fanning spies a customer handling a graphic novel in an appropriate and damaging manner. After confronting the young man, she discovers that his name is Max Yeung, and he is a screenwriter. After some witty repartee, it is decided that Isabelle will read a screenplay Max recently sold and give him feedback. Truthfully, Isabelle is very attracted to Max, but a chance encounter with Isabelle's friend, Leah Winters, leads to hilarity. THE LOWDOWN: The interior pages of Zeitgeist #1 are printed in the landscape format, so readers will have to read it as if they were flipping through a calendar. When I first received a review copy of this comic book from Approbation, I was not sure if I was annoyed or not. I prefer to read comic books the same way I normally do – left to right in the “portrait” layout. Still, there was something about Zeitgeist that kept bugging me and attracting my attention, so I finally surrendered and read it. Zeitgeist is good – really good. It has a situation comedy (sitcom) quality and is somewhat similar to many of the popular television sitcoms of the last three decades that focus on groups of friends, including “Friends,” “How I Met Your Mother,” and Living Single,” to name a few. B. Alex Thompson has created some especially likable characters; you will not have to read too far into the first issue to feel like you want to hang out with these characters. Zeitgeist really seems to capture a defining spirit of modern times... or attempting to do so. The art by John River is clean and expressive. It is like a combination of the graphic styles found in alt-comix and college newspaper comic strips. River uses minimal backgrounds, but they are still highly suggestive. I found my imagination filling in the rest of the environments. I think many readers will find themselves filling out the story by putting themselves in this comic book. 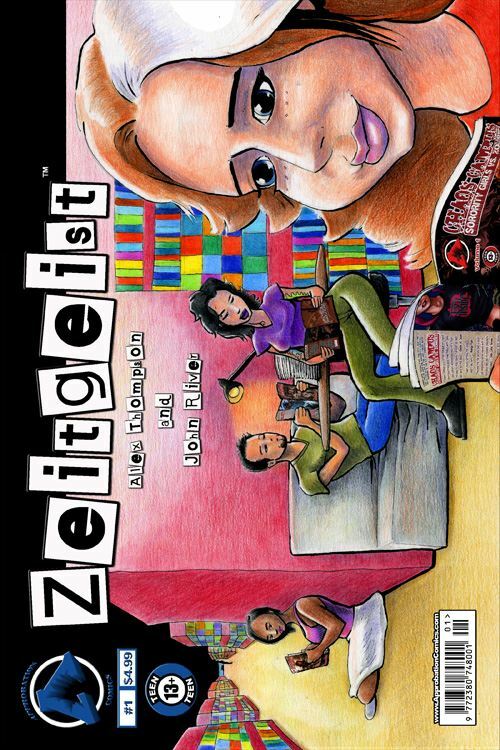 I READS YOU RECOMMENDS: Fans of the comics of Alex Robinson and of relationship comics will want to try Zeitgeist.